A friend is currently attempting to motorize my grain mill, which rules out brewing any beer this weekend. I decided to do another mead instead, to keep in practice. Being a fan of Indian food, when I ran across a recipe for a Rooibos Chai Metheglin (metheglin is mead that includes spices) I decided it sounded like a good option. While that recipe used plain Rooibos tea and spices, I'm going to use Rooibos tea bags which already contain a blend of Chai spices. Will it make as good a mead? We'll find out. Place one gallon of water in a stock pot and bring to a boil. Boil for 10 minutes to sterilize and remove chlorine. Steep the tea bags in the water while adding the honey, yeast nutrient, and yeast energizer. Meanwhile, rehydrate the wine yeast. Chill the must to a yeast-safe temperature and place in a sanitized one-gallon fermenter. Add the wine yeast and seal it. Ferment for three weeks in the original fermenter. Transfer to a secondary fermenter and age for six months. I'll be back in six months (February 2018) to update you on the result. 09/09/2017: Transferred the mead off the sediment into a clean, sanitized secondary. Also tossed in some yeast nutrient to allow any remaining yeast to continue working. The mead is only slightly sweet at this point, and the chai flavors are detectable but subtle. It will be interesting to see where this is in a few months. 10/22/2017: Poured off a little of this for a taste test with a friend. We agreed that it's good and probably ready to be bottled, so I plan to do that later today. Yesterday I toured local meadery Brothers Drake and got to try several of their products. It got me to thinking about how I might try to put a spin on the drink. What I decided was to try mixing the idea of a Mead and a margarita into one beverage. I'd use orange blossom honey as the base, and combine it with dark agave nectar to get a tequila like flavor, adding lime juice to introduce tartness, and sweet orange peel to simulate triple sec. The honey would provide additional orange notes and hopefully a base sweetness. Boil three quarts of water for ten minutes with the lime juice, yeast nutrient, and orange peel in it. Remove from heat and add the agave nectar and honey. Allow it to cool to around 80F and pitch the yeast into it. I placed the mead in a gallon jar with a lid and airlock. There was visible activity, though not a krausen, atop the mead the next day. Airlock activity has been mostly slow, but steady. My plan is to give this about three weeks in the primary fermenter, then rack it off to a secondary fermenter and allow it to age for a month or longer before taste testing. On September 9, I transferred the mead off the sediment and into a clean, sanitized fermenter. At the time, I also tasted a sample. The mead at this point tastes like a very sweet margarita. I rehydrated some Montrachet wine yeast and added yeast nutrient and yeast energizer, then pitched this into the mead to see if it would dry out some of the sweetness. I'll test it again in a month. 10/22/2017: The mead is still incredibly sweet to the taste. It will work fine, I think, when poured over ice - but comes across far too sugary to drink much of it straight. If I do this recipe again, I'll want to increase the amount of lime juice and probably give the yeast repeated nutrient doses to get it to ferment out better. I can't say I'm totally disappointed with it, but it's not what I wanted and it doesn't seem to be drying out much. I've been a fan of Dogfish Head's Palo Santo Marron ale since the first time I had it. The strong brown ale, aged in huge Palo Santo wood tanks is a very rich, unique-tasting brew. I recently encountered a potential clone recipe for it, along with a pound of the Palo Santo wood. The recipe was said to have taken second place at a national competition and some other medals. I ended up adjusting the recipe before brewing, for a couple of reasons. First, I felt like it had too much wheat in it (4 pounds) and I might have had to add rice hulls to keep wort flowing through it. I also couldn't get my hands on de-bittered black malt unless I mail-ordered it for around $13 a pound (including shipping). That seemed ridiculous, so I used Carafa III Special instead. 6 gallons of water were treated with a Campden Tablet and left to heat to 156F. Once the water reached that temp, I added the grains. 60 minute mash at 156F for 60 minutes, followed by 10 minutes mash-out at 167F. The grain was sparged with 1.25 gallons of water at 167F. Pre-boil gravity measured 19.5 Brix vs. the 19.6 Brix that I expected, which was close enough that I was quite happy with it. A 60-minute boil was initiated in The Grainfather, with hops going into a Brew Bag mesh hops bag suspended over the kettle in a hop spider. I measured the gravity twice after the boil and was disappointed to see that instead of the expected 1.118 SG (27.7 Brix) I had only reached 23.1 Brix or 1.097 SG. This will result in a 10% beer instead of the expected 12%. It was about 1:30am when I discovered this, and I decided not to try adding DME or extending the boil, as I was getting tired. Owing to the warm outdoor temps in Ohio this time of year, I only got the wort down to 80F in the fermenter, so I waited until morning to pitch the yeast as this temp was a bit too high for the Edinburgh yeast. The next morning the wort had gotten down to 75F, which was still a bit warm for the yeast but not warm enough to kill it, so I pitched a quantity I had saved from a previous brew and washed. I also pitched in the Clarity Ferm to reduce gluten content a bit, as I have a friend who likes to try the beer but is sensitive to it. The temperature control system was setup for this batch (cold side only) and configured to keep the beer at 68F throughout fermentation. That's a couple of degrees below ambient temperature in my basement this time of year so it should work out fine for primary. I may disable it for secondary. I picked out approximately an ounce (1.2 actually) of Palo Santo wood what I plan to add when I transfer the beer to secondary. This will get a brief soak in Everclear before pitching into the fermenter just to sanitize it. I'm planning to give the beer a week with the wood before bottling, but will probably do some taste tests along the way to make sure it's not overpowering. After discussing with a friend the fact that this beer didn't hit my gravity target, he suggested that as a brewing exercise I might want to consider trying to correct that. I determined that it would take about 5 and a half pounds of malt extract in a gallon of water to bring the beer up to the gravity I wanted. I ordered that from a home brew supply shop and it arrived just as primary fermentation began to slow down. I boiled the extract for 15 minutes in the water, then chilled it to 80F, and added it to the fermenter. This nearly filled the 7-gallon fermenter, so I replaced the airlock with a blow-off tube. That proved to be a smart move, as the next day I found the tube filled with residue and the water jug it rested in filled with a diluted version of the beer. My best attempts at calculating the result suggest that this beer should come out at 11.4% ABV rather than the 9.9% it would have before. That's still not the 12% I was originally aiming for, but close enough. When primary fermentation seems to have finished, I'll transfer the beer to a secondary fermenter and add the Palo Santo wood sticks to give it (hopefully) the same flavor as the Dogfish brew. Update 09/07/2017: Surprisingly, the beer is still fermenting steadily. The blow-off tube is burping CO2 about every 10-15 seconds, so I'm leaving it alone for a bit longer. When the activity seems to be dying down, I'll transfer it to a secondary fermenter and add the Palo Santo wood sticks. 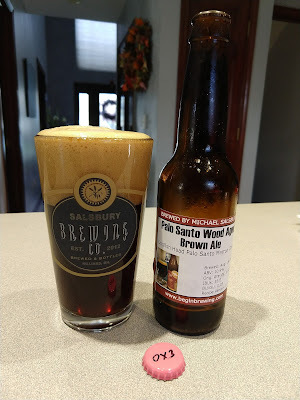 A taste test of the beer revealed a very strong sulfur aroma, but a solid hop-forward flavor that is what I would imagine Palo Santo Marron might taste like without the wood aging. Update 09/12/2017: Burps through the blow-off tube have slowed to about every 45 seconds. I decided to transfer the beer to a secondary fermenter to finish out, as it's probably nearly finished. I added 1.2 ounces of Palo Santo wood sticks that had been soaking in Everclear for several days to sanitize them. I did not add the Everclear but kept in in reserve if needed for flavor later. I plan to taste the beer daily for the next week to gauge how much flavor the Palo Santo wood is adding, as I could already detect a hint of it in the sample I took for the gravity reading. If necessary I'll sanitize a strainer and fish out the wood sticks to keep from over-flavoring it. Palo Santo wood is very fragrant and strong stuff. Update 09/13/2017: I've seen no airlock activity since transferring the beer to secondary, so I suspect fermentation is finished at this point. The refractometer reading was slightly higher (16.1 vs. 15.7 or 15.7) after the transfer. The Palo Santo wood flavor is increasing noticeably. Update 09/17/2017: The Palo Santo flavor is quite strong and seemed to have topped out today, so I decided to bottle it. The wood gives the beer a combination I'd describe as a combination of coconut, vanilla, cinnamon, and wood. It lends an almost incense-like aroma to the beer as well. I used 5.25 ounces of corn sugar to carbonate six gallons, which should generate about 2.5 volumes of CO2 in the finished beer, an appropriate amount for the style. Update 09/23/2017: Last night I labeled all the bottles, placing a couple in the fridge for sampling. Opening one after it had chilled yielded the expected "hiss" but pour the beer in the glass (hard) yielded no visible hint of carbonation. This was very disappointing but not entirely unexpected. I have been keeping the bottles in 76F environment and inverting them daily to rouse the yeast into suspension, but I'm currently thinking I'll need to increase the temperature to 80F and continue inverting them for another week or so. On the bright side, the beer has a great aroma and flavor. It reminds me of coconut and vanilla with a hint of cinnamon. Update 10/4/2017: Between the last update and today, I took a bottle of the beer and refrigerated it. There was little or no carbonation yet again. To hopefully rectify this, I increased the temperature inside the conditioning box to 80F. I've also gone down each day and inverted the bottle completely. One day the bottles sit on their caps. The next day they sit on the base of the bottle. This should rouse the yeast inside and flow it past all the priming sugar inside the beer. Update 10/8/2017: Having given up on the original yeast carbonating this one, I decided to make an experiment out of it all. I rehydrated some CBC-1 Cask and Bottle Conditioning yeast and gave it some Brewer's Crystals to proof it, along with a tiny amount of yeast nutrient. When the yeast slurry showed signs of activity, I opened a package of carbonation drops and sanitized a batch of caps. I opened a bottle, dropped in a carbonation drop, and used a sanitized pipette to inject some live CBC-1 yeast into the bottle. I used 0-2 carbonation drops and 1-6 doses of yeast per bottle. I then re-capped the bottle and marked the cap to indicate how many carbonation drops (if any) and yeast doses were added. If any of the combinations produce an acceptable level of carbonation, I'll use that same configuration to open and dose the remaining bottles. If not, I'll have to drink this one flat or force carbonate it in a 1-gallon growler I have. Update 10/15/2017: After a week in the hot box (76F), with daily inversion of the bottles (i.e., one day they sit on the cap, the next day on the bottom of the bottle), the beer is finally carbonated. The bottle used for the photo at the top of this article had two carbonation drops and four doses of active yeast added to it, and had a healthy amount of carbonation. I need to try a few of the other dosage levels to see what gives the beer its best flavor, aroma, and carbonation level. Update 11/12/2017: I finally took the time to rehydrate some yeast and get it active. I used this to dose all of the remaining bottles with 3 doses for smaller bottles and 6 for 22-ounce bottles. In a couple of weeks, this should be ready to drink, hopefully. Palo Santo Marron pours a very dark brown with a light brown head that lasts quite a while. My beer poured an opaque dark brown (lighter than Palo Santo Marron) with a similarly thick head. Mine was a bit clearer and slightly lighter in color. The head on mine was lighter in color and although it lasted a while, it did not last as long as Dogfish Head's. The Dogfish Head beer's head was also a little more creamy. Palo Santo Marron has a chocolatey aroma with maybe a hint of leather. My beer had a very strong Palo Santo wood aroma which is like a combination of coconut and chocolate. Mouth feel on both beers was thick, with the Dogfish Head beer being a little bit thicker. The flavor of Palo Santo Marron is slightly bourbon-like, with coffee notes, a fair amount of hops, and a bitter finish that seems to be a combination of dark roasted grains and hops bitterness. Palo Santo Marron is slightly sweet, but mostly dry. My beer was moderately sweet, not quite to the point of cloying but getting close to it. 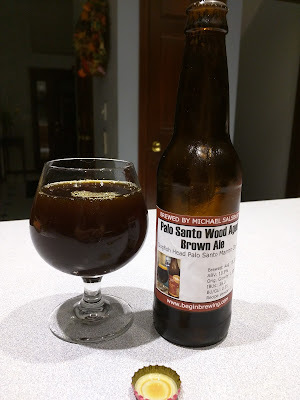 The Palo Santo wood flavor in mine was much, much stronger than that of Dogfish Head's beer. Mine finished more chocolatey and not very bitter. There are similarities in the flavor, but these are subtle. All things considered, it was difficult to choose one of these beers over the other because they are quite different. Both are good for different reasons, and not good for different reasons. I liked the Dogfish Head beer better because it was a bit more dry, but disliked the bitterness from the roasted grain and hops. I liked the fact that mine had a more clear Palo Santo wood flavor and lacked the bitter elements of the Dogfish Head beer. I think my ideal beer would be somewhere between the two. Get the wort closer to the intended gravity in the kettle before fermenting. I think adding the extra malt in primary threw off the balance a bit. I'd either increase the grain bill or add the extra during the boil rather than later. Decrease the Palo Santo wood contact by about a day. Consider adding a small amount of bourbon (maybe 3-4 ounces at most) to better mimic the flavor in the Dogfish Head beer. Consider doubling the Chocolate Malt to add a little more character. 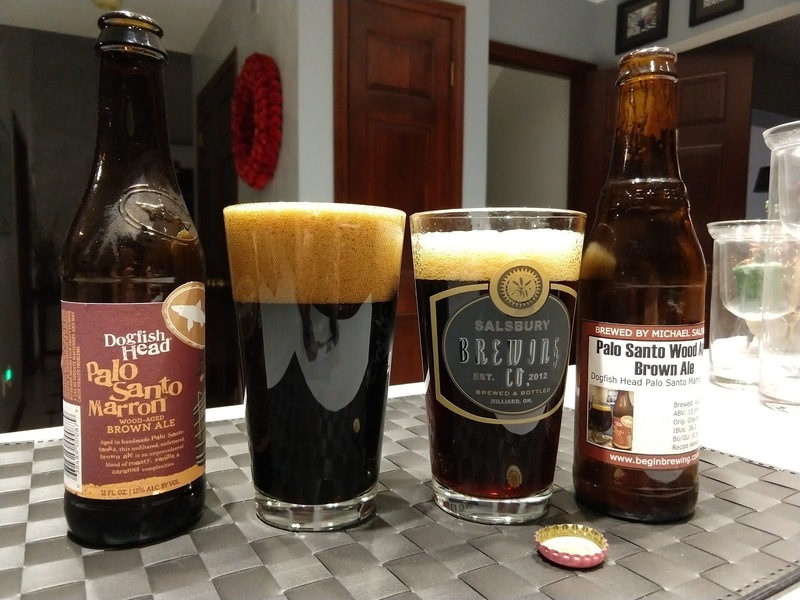 The intent of all the above changes is to drop the sweetness a bit, slightly increase the bitterness, decrease the Palo Santo wood flavor, and add that more oaky bourbon-like note in the Dogfish Head beer. These changes, I hope, would get me a beer somewhere between the dry, bitter Dogfish Head original and the sweeter version I made here.